The world is a tough room right now. Lately, it takes only a few seconds for a hearty laugh to lapse into a hurty reminder that we are living in aggressively unfunny times. Absurd, yes. Amusing, not really. Maybe it’s why comedy seems to be having such a tough time. Across the board, it feels like there’s a crack in our national smile. A numbness in the funny bone. It’s not that people are having trouble figuring out what is funny; it’s more a problem of what funny is. 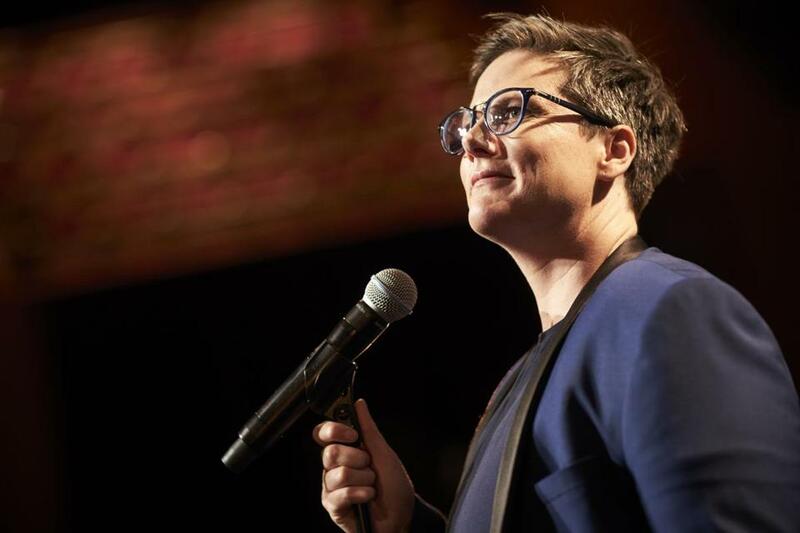 Take the runaway popularity of Hannah Gadsby’s brilliant Netflix special, “Nanette,” which could have been a comedy special had Gadsby been able to bear such a thing any longer. In fact, the hourlong performance from the Sydney Opera House serves not only as a stunning one-woman show but as a document of Gadsby’s exit from comedy. No punch line. In one of the special’s most striking stretches, Gadsby, a 40-year old lesbian with over a decade invested in the business, explains her decision to walk away from making jokes — and a big part of the problem? Jokes. From there, and without giving too much away, Gadsby unspools the standard stand-up structure and weaves wildly separate threads of gay pride and shame, art history and horsepucky, white male privilege and . . . well, more white male privilege, into a knot that sits in your stomach. There’s no way to laugh it out of your system, and that’s by design. It’s a crushing exploration of just how funny works — and for whom. Gadsby explores how power and privilege shape what we laugh at — by now the terms “punching up” and “punching down” are well-worn standards for where to aim one’s fire. Still, Gadsby’s explicit explanation of how funny functions in a world stratified by difference feels especially worthwhile right now, as comedians like Samantha Bee, Michelle Wolf, and Kathy Griffin weather disproportionate scrutiny for offenses of language, decorum, and “good taste,” respectively (as though either has ever been a concern for male comics). And the distinctions Gadsby draws between humility and humiliation come racing to mind when watching Sacha Baron Cohen’s new deep-prank series, “Who Is America?” The Showtime series finds the comic occupying a variety of costumes to embarrass an all-star list of unwitting rubes including Sarah Palin, Roy Moore, Representative Joe Wilson, and former Congressman Joe Walsh — the latter two of whom were on board with his character, the Israeli “Colonel Erran Morad,” and his “Kinderguardian” program to arm toddlers. At times, “Who Is America?” feels less like a satire and more like an experiment in whether satire is sustainable in our new environment. That is, when the end result of a joke is that the person you meant to reveal as a fool is actually exposed as a monster, it’s hard to know where to put all those laughs. The tension, as Gadsby might put it, finds no release, it just spirals and builds and darkens like a cyclone. This hunger for a punch line that doesn’t arrive becomes anger. In fact, a lot of what’s floated as comedy right now lands more like smuggled fury. Even though I turn to Colbert and Conan and Kimmel and Bee and Noah and Seth (and not Fallon) every evening to help me sleep at night, it’s starting to feel more like a therapy session than a comedy set. It’s as though below every monologue runs the same undercurrent of bewilderment, a seriousness that anchors each joke to the uncertain ground. ‘Nanette,’ the brilliant Netflix special from Hannah Gadsby (above), serves not only as a stunning one-woman show but as a document of Gadsby’s exit from comedy. “Laughter is just the honey that sweetens the bitter medicine,” Gadsby says like a mother explaining death to a child toward the end of “Nanette,” and she’s right. As punch lines go, it’s a killer.